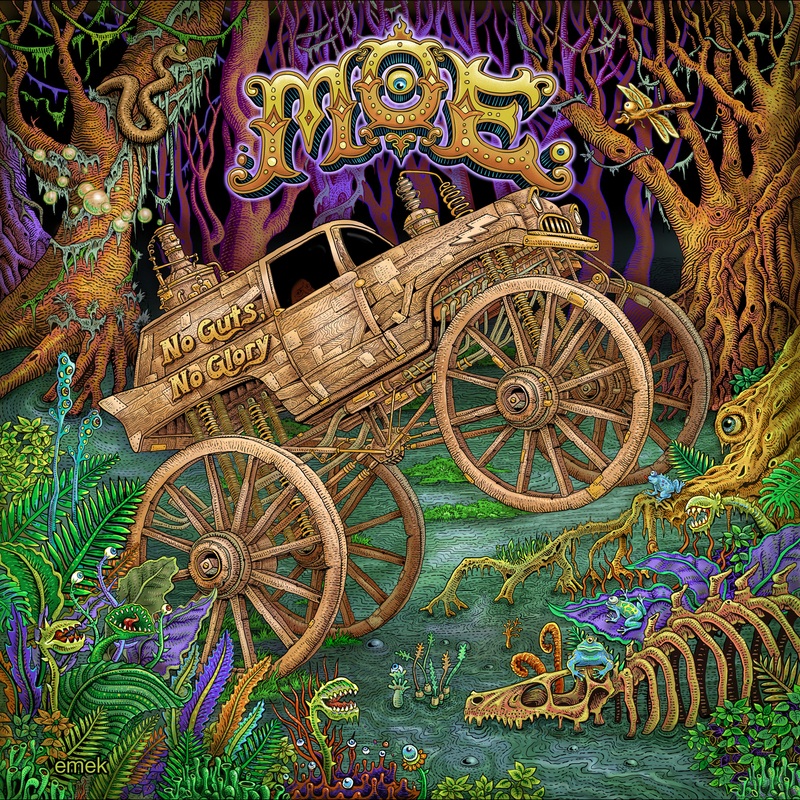 Welcome to my review of upstate New York jam band moe. 's eleventh studio album No Guts, No Glory. It's got some really good songs on it. Some that the band has played live recently and some that have not popped up on the bands set lists yet. Jam band moe. released their eleventh studio album, No Guts, No Glory on May 27. It's a solid album with some really good songs that every moe. fan should have. I've seen moe. play live many times and have always enjoyed those live shows. There is something that is unique and engaging about them that I easily connect with. So, when I heard they were putting out a new studio album I was excited to hear it. I don't buy studio albums much anymore, but I figured I'd get the deluxe version with three bonus songs from iTunes, because I'm going to be seeing them at the LoHi Festival in Denver in a couple of weeks. I want to be prepared in case they play any of the new songs at that show. The album opens with the only Chuck Garvey composition on the album "Annihilation Blues." Garvey's songs are usually quirky in a good way and "Annihilation Blues" is not an exception. I think it's a great song to open the album and fits in great with the rest of moe. 's repertoire. I can't wait to hear it played live. On first listening, "White Lighting Turpentine" is mostly forgettable. But, I can see how it will grow on me. The same with Rob Derhak's "Same Old Story." "Same Old Story" is a different kind of song than I typically like to hear from moe. These songs are not bad, but there is no interesting new ground covered here for me. Next is Al Schnier's latest showcase song "Silver Sun." The band have been playing this song live for a while and have finally put it on a studio album. It's already a live audience favorite. There is a very Beatle's like quality to the vocal portion of the song. Played live, this song is often stunning in it's beauty and grace. Listen to this version from a show I recorded at the Ogden Theatre in Denver on November 30, 2012. (Pick track number 9 to stream it) I just love the twin lead guitar parts. You can hear every member of the band strongly participating in this song live and on the studio version. They also did a great job of capturing the live feel of this song in the studio. The next Derhak composed tune, "Calyphornya" is another good, solid moe. song. Starting with acoustic guitars and strong vocals from Derhak, this one is very good and has some potential for opening up when played live. It makes me wonder what the band's fascination with song titles named after California is all about though. One thing I notice about this album is that percussionist Jim Loughlin's contribution is downplayed on some songs. I don't hear enough of his percussion playing on this album. It's strange, because he is right out front in the mix when the band plays live and I always appreciate hearing his input live. After Schnier's "Little Miss Cup Half Empty" is another Derhak penned winner, "Blonde Hair and Blues Eyes." This song has been played live recently and is quite engaging. It reminds me of "Raise A Glass" from the Sticks and Stones album. The horns on the studio version sound good, but don't add to the song in a substantial way for me. I see this song developing as a good encore choice for live shows in the future. The country tinged "Do Or Die" is another good song the band should incorporate into their live sets. The standard album finishes with "Billy Goat" which is also another nice song that has been played live recently. The studio version has a spoken word intro that is unique. This song gives Derhak a chance to feature his honed slap bass playing style. In my opinion, "Mar De Ma" and "Runaway Overlude" two of the three bonus tracks should have been included on the album. "Runaway Overlude" is such a strong song when played live, it can elevate a set from good to great. Overall, I really like this album. If you are already a moe. fan buy the deluxe version that includes the three bonus songs. Those songs fill out this album nicely. Now that I've done my home work, I'm looking forward to hearing moe. play some of these new songs live in a couple of weeks.